Jefferson Pierce returns to his old stomping grounds – the infamous Suicide Slum of Metropolis – in order to bring some hope to the residents of his downtrodden former neighborhood. Hell quickly learn, though, that a lawless place sometimes requires a lawless vigilante to drag it into the light. 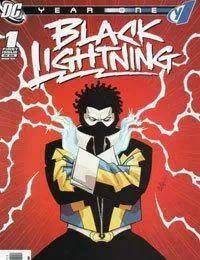 Acclaimed writer Jen Van Meter (CINNAMON, OUTSIDERS) and kinetic artist Cully Hamner (BLUE BEETLE, RED) combine forces to retell the electrifying origin of DCs most honorable hero, the bold and brave Justice Leaguer known as Black Lightning!